If you are planning a kitchen remodel, whether to increase the resale value of your home, or for your own living pleasure, don’t neglect the countertops! Depending on your needs and budget, there are many great countertop materials to consider. In general, they can be divided into two categories: natural and man-made. Also, you can use our Kitchen Countertops Cost Calculator to estimate the price of your project. Granite is my personal favorite and with so many color and pattern varieties, there is a slab of granite to please any eye. In addition to timeless elegance, granite offers nearly unrivaled durability, so it is an all around win. Granite countertops can be paired with everything from traditional or farmhouse-style cabinets to ultra-modern and sleek installations to equally dazzling effect. 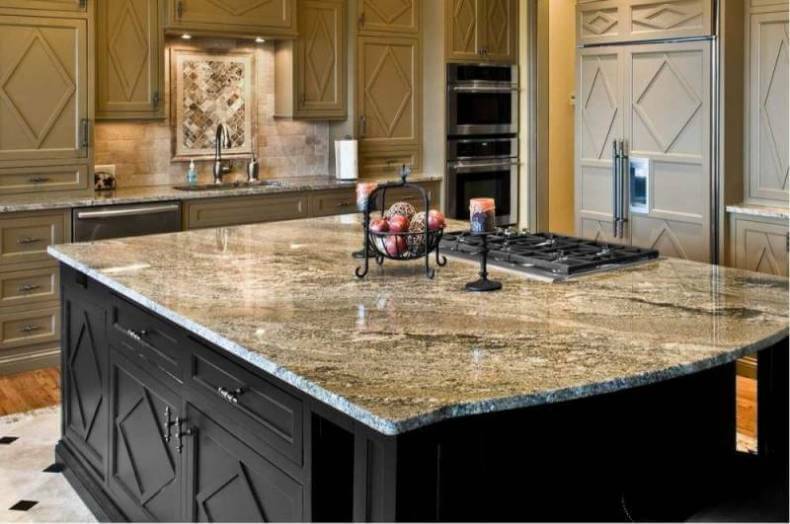 Granite is high-ranking on the Mohs Scale of Mineral Hardness, making it a very durable choice. Granite countertops can be cleaned and disinfected easily on a daily basis with a cleaner formulated for natural stone surfaces. Some granite materials will never require sealing, while others can be more absorbent and require resealing on a semi-annual basis. Cost: You should expect to invest between $40 to 100 per square foot for materials and installation of granite countertop materials, depending on the particular type of granite you choose and the complexity of installation. 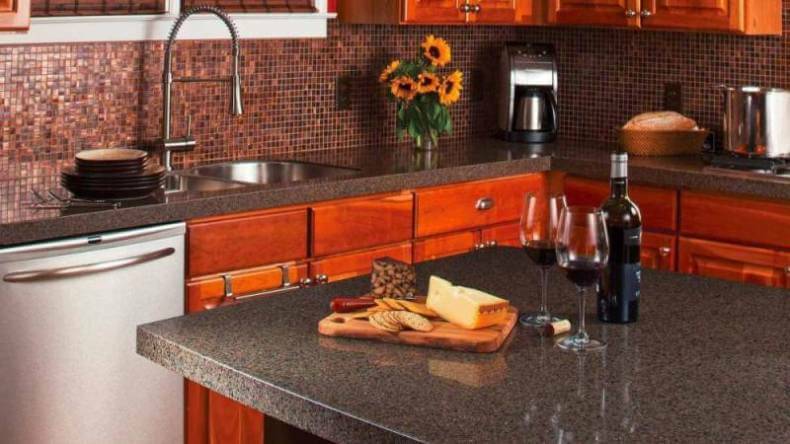 Learn how we bought Premium Netuno Bordeaux granite countertops for only $56/sq.ft. (costing $2856 for a 51 s.f. job). Another classic option that never goes out of style are marble countertops. They can be ideal if you’re less active in the kitchen. 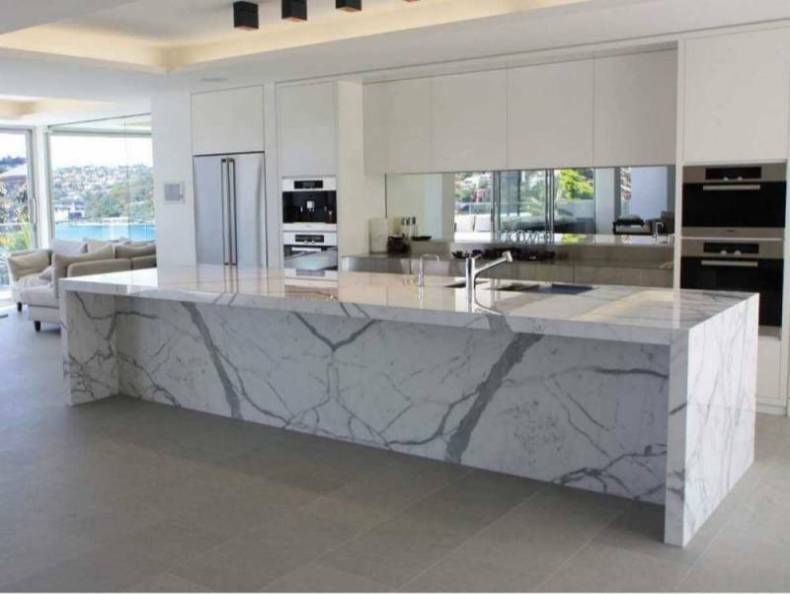 Since marble is significantly softer and more susceptible to staining and scratching than granite, it may not be the best fit for countertops which will be expected to withstand heavy use. While marble can be fairly versatile in terms of color schemes and cabinet styles, it’s most popular in all-white kitchens with traditional cabinetry. Maintenance can be a challenge, especially if you want to avoid marble’s tendency to develop a patina with use. Even the mildest detergents can dull the surface, and it will need to be sealed every two years at minimum. 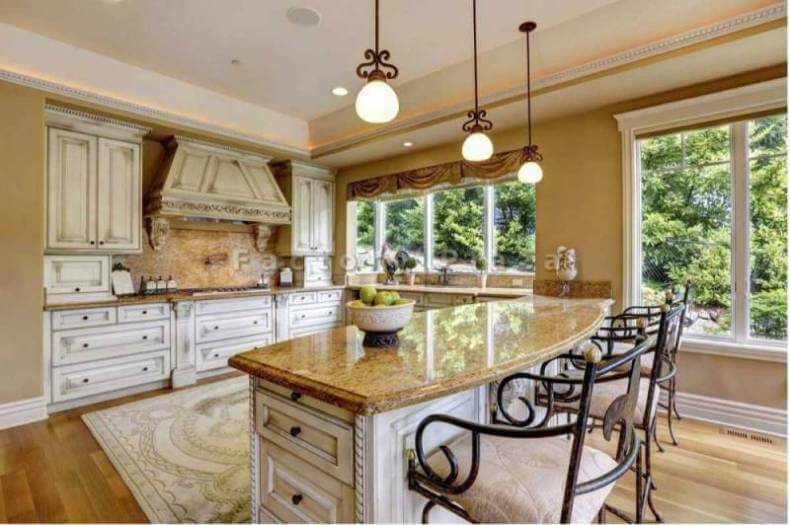 Cost: Marble countertops are synonymous with luxury, and luxury comes with a price. With a $125 to $250 per-square-foot range, marble’s close to granite’s price point for materials and installation, but will usually involve more cost over time for maintenance and protection. If your kitchen remodel calls for a workhorse countertop to accommodate your love of cooking without breaking the bank, a wood or butcher block countertop just might fit the bill. Made from natural wood, sanded until smooth and sealed for durability, wood and butcher block countertops are available in a wide range of wood types and finishes. The most popular wood types include maple, cherry, zebrawood, bamboo, wenge, or a mixture of a few different wood species for a unique look. Butcher block countertops natural look will pair well with almost any cabinet color, and offers a striking focal point in white or light color kitchens. While they’re resistant to cutting and scratches, wood countertop materials can also be sanded periodically to remove any signs of wear. They do need to be sealed regularly to prevent bacterial growth, but are easy to clean. 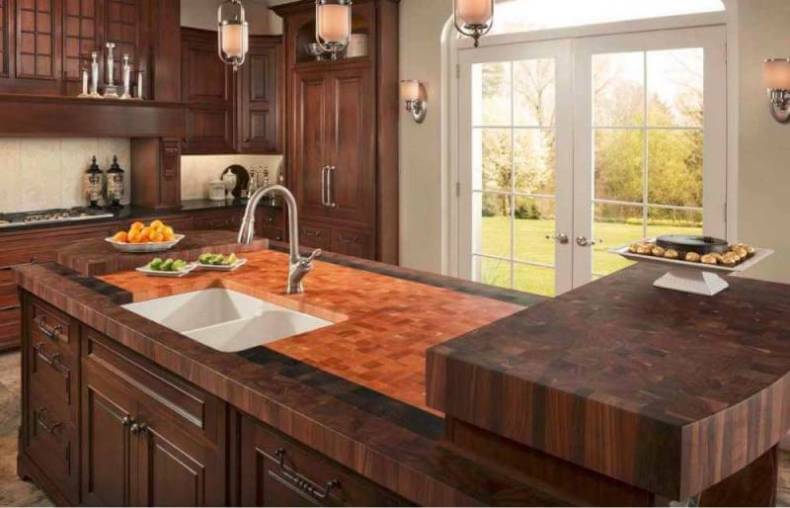 Cost: Butcherb lock and wood countertop materials can be made of a variety of woods, and the one you choose will affect the price. As a general rule, costs will range from $35 all the way up to $200 per square foot. 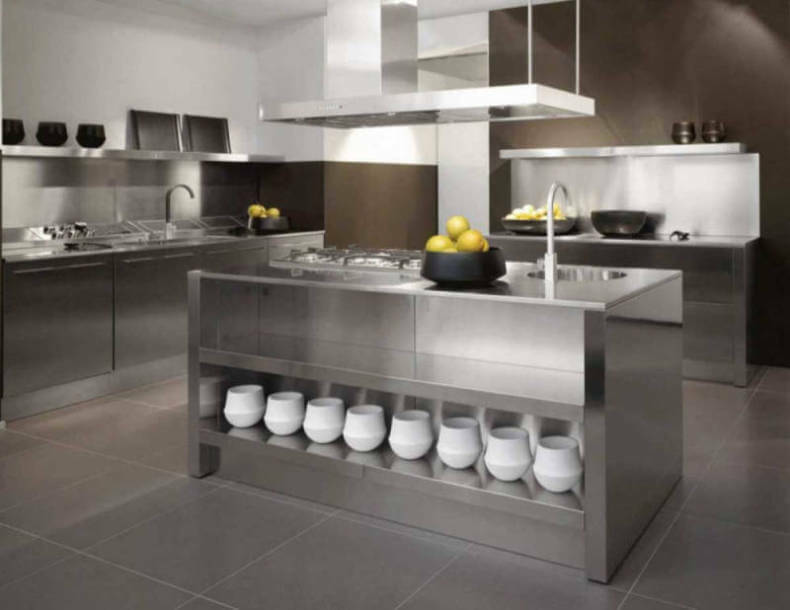 If you’re working towards a more streamlined, modern aesthetic with sleek cabinetry and minimalist design cues, or if you’re a serious cook who spends lots of time in the kitchen, stainless steel countertops are worth consideration. Made of at least 10,5% chromium for rust and corrosion resistance, stainless steel is available in a wide range of grades, dependent upon the other alloys used. It also comes in several gauges, which determines thickness and strength. Because it’s nonporous, stainless will not facilitate bacterial growth or stain, can be cleaned with ease, and is completely nonabsorbent. It will, however, gain a patina over time. Cost: For kitchen-grade stainless steel countertops, you should budget between $100 and $200 per square foot for materials and professional installation. Whether you call it “engineered stone,” “engineered quartz” or simply “quartz,” there’s no denying the beauty of this countertop option. In most cases, color schemes for engineered quartz will fall somewhere along the earth-tone spectrum, making them an ideal choice for natural wood cabinetry and particularly well-suited to contemporary kitchen decor themes. It’s so durable that most manufacturers will offer a warranty, which is not typically the case with natural stone options. 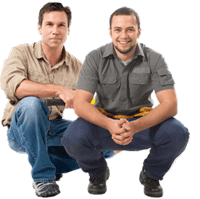 Cleaning is easy with any sanitizing spray, and maintenance requirements are negligible. Cost: Depending on how much work you’re planning to do yourself and the grade of quartz chosen, your new countertops can cost anywhere from $40 to $200 per square foot for materials and installation. When you’re looking for a countertop material that won’t exhaust your entire kitchen budget, laminate could be the option you’re looking for. Made of particle board bases with a layer of bonded plastic to create the work surface, laminate is by far the most affordable material. It’s also relatively durable, and offers a more diverse range of colors and styles than almost any other option on the market. Because of this, it’s fairly easy to find a laminate product which will work with almost any finish or style of cabinet. Cleaning is a breeze with a simple sanitizing spray, but laminate is somewhat susceptible to scratching and will not tolerate high heat. Cost: Choosing laminate countertops is ideal if you’re on a tight building or remodeling budget, since costs will typically run between $20 and $50 per square foot for installation and materials.